The 2019 Dodge Durango from Banks Crossing Chrysler Dodge Jeep Ram in Commerce, GA, serving Athens, Jefferson, and Toccoa, is an adventure-driven SUV with incredible capability. The aggressive styling helps you conquer the road with confidence and turn heads at every stoplight. Behind the signature floating, split-crosshair grille sits an incredible 3.6L Pentastar® V6 engine with 295 horsepower and up to 6,200 pounds of towing capacity.1 Fill the cabin with people and cargo, and expand your storage capacity with the 60/40 split-folding rear seat and an available Stow N Place® roof rack system with removable crossbars. Let the standard three-zone automatic climate system regulate cabin temperature while the Uconnect® 4 system provides plenty of entertainment options on a 7-inch touchscreen display. Enjoy standard connectivity features like Apple CarPlayTM and Android AutoTM smartphone integration, and get internet on demand with an available 4G LTE Wi-Fi® hotspot. Our 2019 vehicle inventory is here and we have amazing deals you have to see to believe. Take your test drive today by visiting Banks Crossing Chrysler Dodge Jeep Ram at 2377 Homer Rd, Commerce, GA 30529. Don't miss out on owning the new 2019 Dodge Durango you've always wanted! Carry up to 150 pounds of additional cargo with the available Stow N Place® Roof Rack System with stowable crossbars. When not in use the crossbars can fold into the side rails to help improve aerodynamics and reduce wind noise. Fit up to seven people or try more than 50 different seating configurations to carry your cargo and passengers. 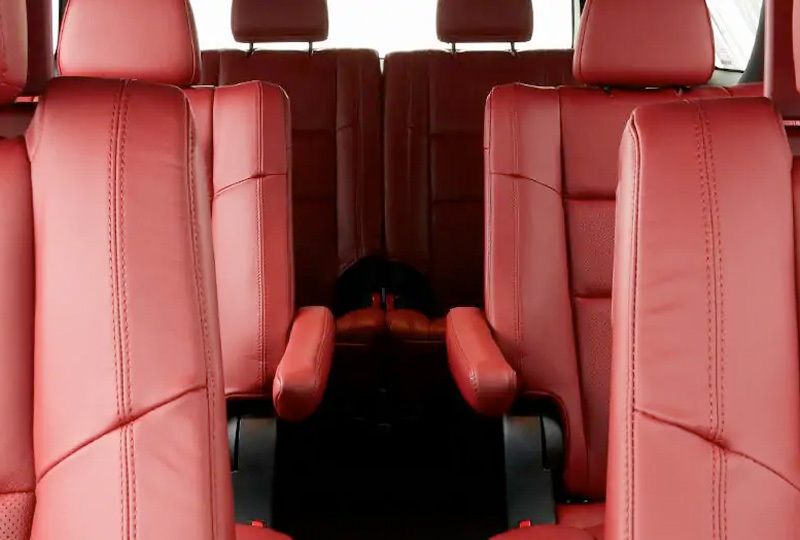 Available premium Fold & Tumble second-row captain's chairs allow your passengers to move from the second to the third row between the chairs (when the vehicle is not in motion). Let your passengers enjoy more than the ride. Pop in a Blu-ray™ disc for your second-row passengers with the available Class-Exclusive 9-inch high-definition dual-screen Blu-ray Entertainment System2 with High-Definition Media Interface(HDMI). 2. Based on the WardsAuto Midsize Sport/Utility Vehicle Segment. Excludes other FCA US LLC vehicles.